Do you want to update your ugly 80s kitchen, but remodeling isn’t in the budget? I’ll show you how to paint melamine and oak kitchen cabinets and update them with new hardware. Melamine cabinets with oak trim were a popular style back when I was a kid. Now they’re just an eyesore! I’ll show you how to update melamine kitchen cabinets with paint and new hardware to give them a brand new look. The before and after photos speak for themselves! I’ve even provided a handy checklist with additional tips, so you can enjoy your new kitchen sooner and with less mistakes. We’ve made a few changes to our kitchen to improve the flow and storage situation. The fridge moved to where an exterior door once was and I installed a used kitchen cabinet in its place for pull-out trash cans. Even the 80s track lighting was replaced with a shiny new kitchen track lighting. But all these new things made the rest of the kitchen more drab than ever. The melamine cabinets with oak trim looked so sad next to the bright white and stainless steel. Adding insult to injury, our blue laminate countertops with oak trim were being upstaged by the contact paper covering the countertop of the new cabinet. 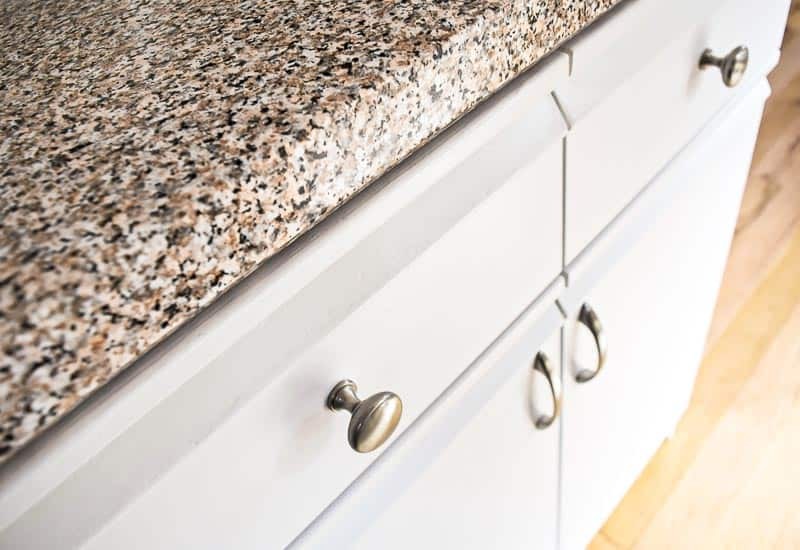 Yes, even stuck-on fake granite is an upgrade! 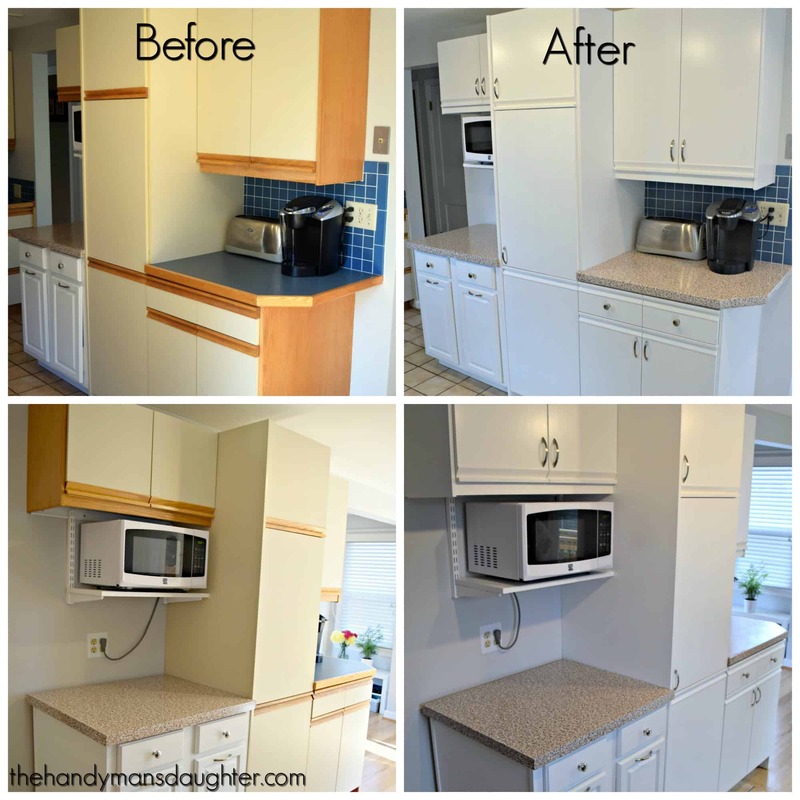 Check out how my contact paper kitchen counter has held up over the last two years! Something had to be done. I really wanted to paint the cabinets white, but I was worried about how well regular paint would stick to melamine. Rustoleum Cabinet Transformations is the perfect paint for melamine cabinets, and the kit comes with everything you need but the brushes. Perfect! These tips are specifically made for those of us suffering with these ugly melamine cabinets with oak trim. There are a lot of steps, but you can do it! To make it easier, I’ve created a checklist with all my tips on how to paint these 80s kitchen cabinets. Sign up below and get it delivered straight to you inbox! FREE 10-PAGE GUIDE AND CHECKLIST! Sign up for my email list and get a FREE 10-page guide and checklist to help walk you through every step to updating your 80's kitchen cabinets! Success! Thank you for signing up for my email list! Check your email for your free guide and checklist! I can’t stress it enough! If you don’t prime the oak portions of the cabinets, the orange WILL show through. 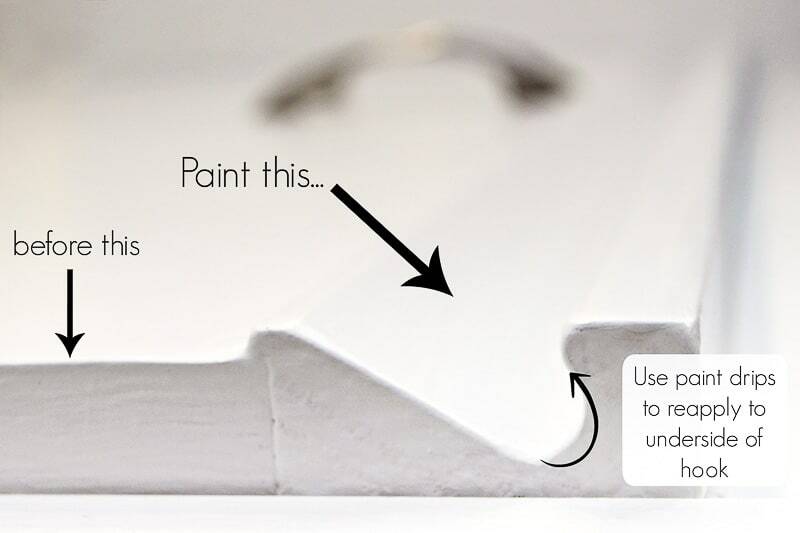 The small kit only has enough paint for two coats, so you run the risk of using up all your paint before the project is complete. A good primer will cover up the oak, and prevent the tannins from seeping to the surface. I started painting the cabinet frames first, and didn’t prime the oak side panels first. Big mistake! The white turned an orangey-yellow as it dried, and it took 4 coats to cover it up. Half the can was gone and I hadn’t even started on the doors! Zinsser B-I-N primer, which is shellac based, stopped tannin bleed amazingly well. I used one coat of primer on the melamine cabinets, and two on the oak sections. After two coats of the paint supplied in the kit, the orange was gone! Of course, you should use a high quality brush for the flat parts of the cabinets. You can even get away with a roller if you don’t plan on using the decorative glaze included in the kit. But what about the hooked part of the grab bar, and the thin cabinet frame? A regular brush slops too much paint in these areas, leaving big blobs that need to be sanded down. I used a 3/4″ wide artist paint brush to get into the hook and along the edges of the doors and cabinet trim. Just a small amount of paint on the very tip of the bristles will suffice. I found I had a lot less dripping this way, even if it meant I went back to the paint can more often. You can see that I didn’t even need to tape off the inside of the cabinets using this brush! The trademark of these 80s kitchen cabinets is the oak grab bar. But when you paint the grab bar on a flat surface, a lot of that paint is going to drip down before it has a chance to set. Stupid gravity! Instead, paint the hook first, then move on to the rest of the door. Then go back to the hook area, and run the artist brush over the pooled paint. Use that paint to go over the hook again. This does two things. First, it removes the pooled paint before it hardens and makes a big blob inside the grab bar. Second, the pooled paint is more tacky than fresh paint, which makes it easier to stick to the top of the hook. The two materials these 80’s kitchen cabinets are made from take paint differently. The melamine is super smooth, but the oak has large pores and open grain. These differences are visible even with many coats of paint. 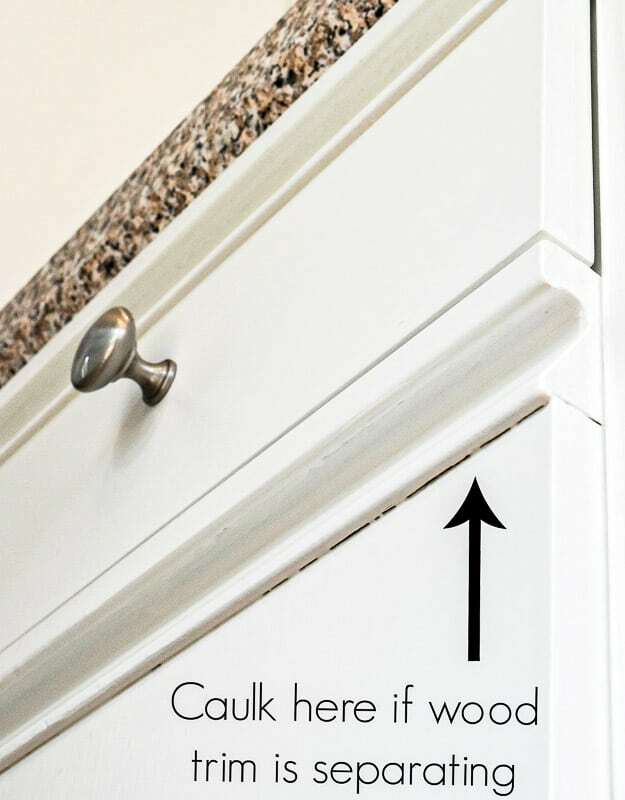 If you’re planning to keep these cabinets around for the long term, using wood grain filler to even out the texture will make a more flawless finish. We only plan to keep these cabinets for another year or two, so I skipped this step. You can see the obvious difference in texture here. 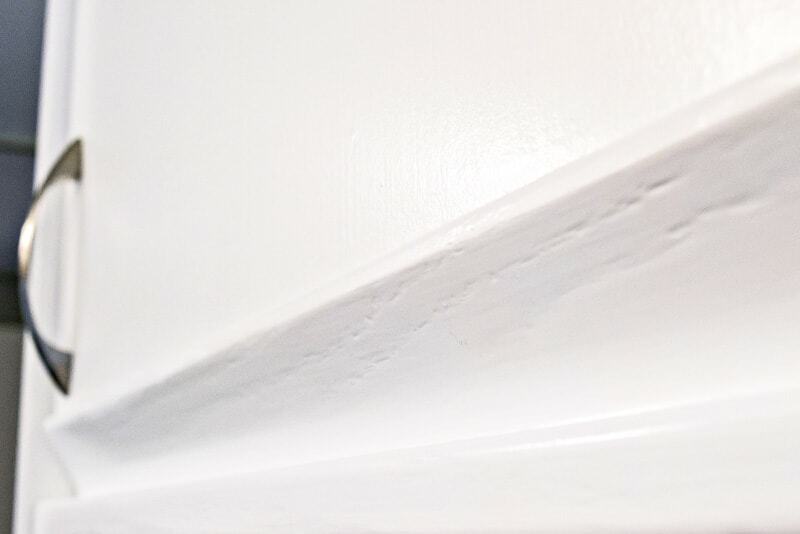 You may want to caulk between the wooden grab bar and the melamine door for a more seamless finish. One of our grab bars was separating a bit from the door, leaving a gap that paint couldn’t fill. Luckily, it was a lower cabinet, and you would have to be lying on the floor to see it. Adding a line of caulk in this gap would go a long way to making these doors look like one solid piece. For wood cabinets, it’s always best to brush with the grain. But melamine doesn’t have a grain! Brushing the paint and top coat in the same direction will result in some raised brush strokes and uneven top coat. 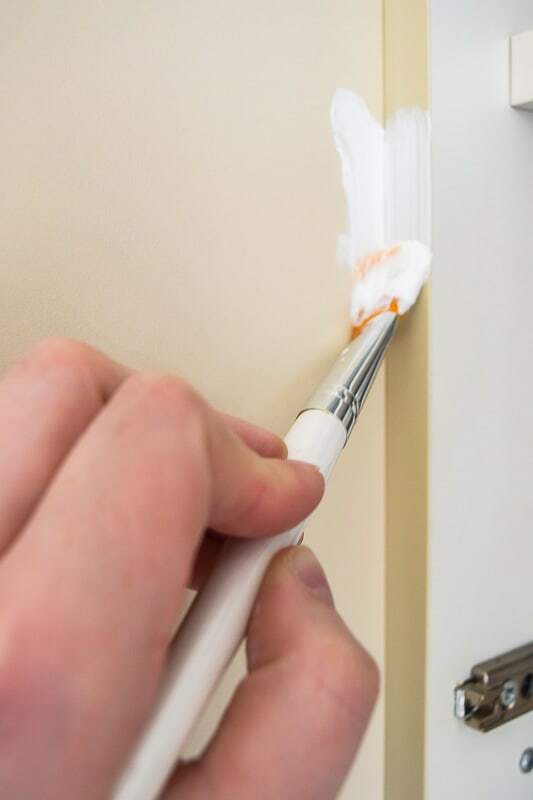 By brushing the top coat in the opposite direction (horizontal instead of vertical), the clear top coat skimmed over all the bumps, making the final surface dry to a glassy finish. Alternate the direction of the brush strokes of the paint as well for a flawless result. 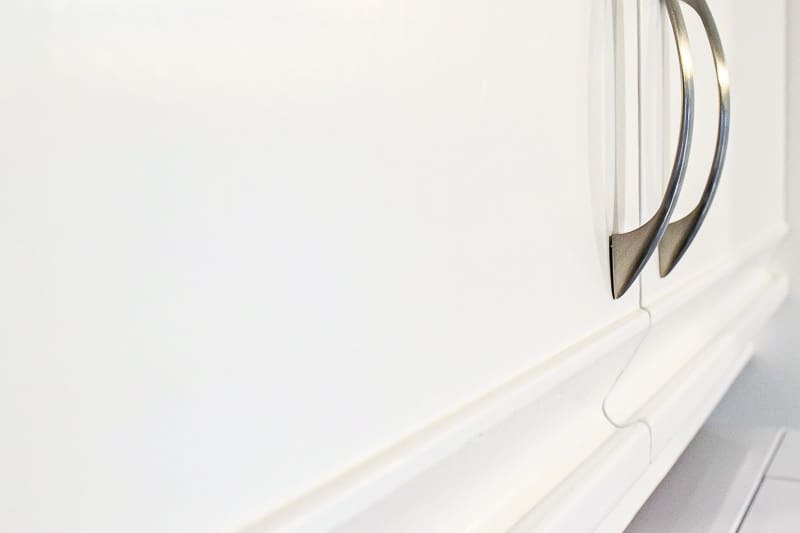 Adding new hardware to these cabinets brings them up to date, and preserves your brand new paint job. 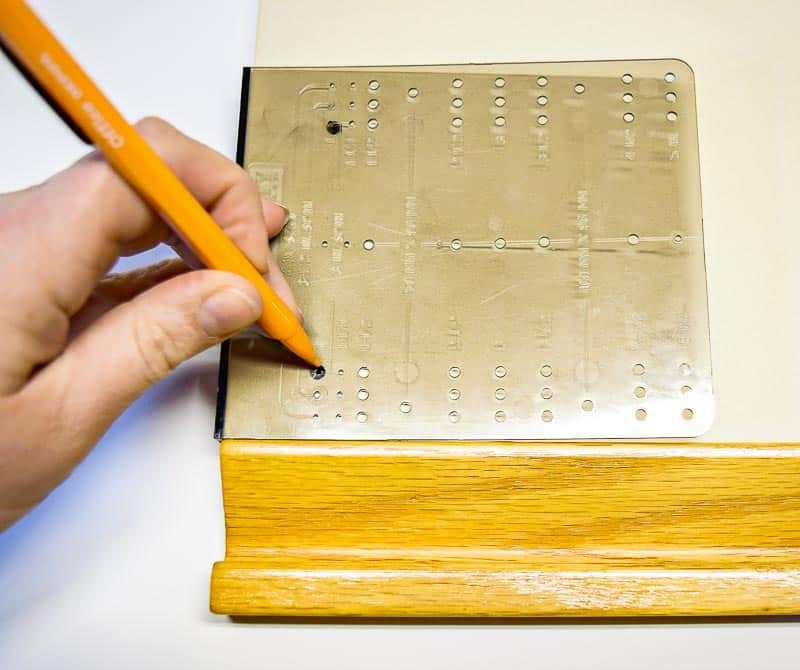 Drill the holes for your hardware before you start painting. This handy cabinet door and drawer template made it simple to mark the holes for my new door pulls. Melamine is prone to chipping when you drill or cut into it, so it’s best to use a sacrificial board under the door to drill into. Clamp the door and board down to the work surface so nothing shifts and the board is held tight to the back of the door, then drill your holes. The board will hold the melamine around the hole in place so you get less chipping. I hope these tips help make the process of updating your 80’s kitchen cabinets a little easier. The results are totally worth it! Don’t forget to check out the complete before and afters of my kitchen update so you can see for yourself what a little lot of paint can do. Very well done and comprehensive post. It looks great now. We have to update our cabinets with a redo. Can’t afford new ones. I’m excited to get started after seeing your results!! They turned out pretty.Thanks for sharing at the Inspiration Spotlight. Pinned & shared. Hope to see you again soon! Thanks Theresa! Our cabinets came out better than I thought they would, so I encourage anyone who is thinking about painting theirs to go for it! Wow! You did an outstanding job! Your cabinets and counters look amazing! Your painting tips and painting job are awesome. Great Job. I know you are happy! Thanks Wendi! It really makes a huge difference in our kitchen, and makes it much more tolerable until we get around to remodeling the whole thing. 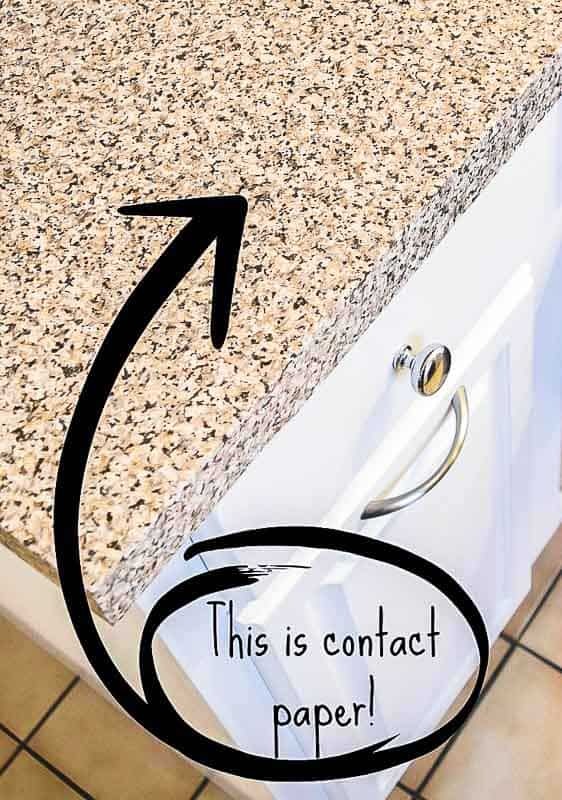 I can’t believe that is contact paper on your counters…do they make a special kind just for counters?? Thanks for sharing at the #HomeMattersParty! They do! I used a regular contact paper that has a granite print on it, but they also make ones that are counter width so you don’t have any seams. You can find an example of the wider version here (affiliate link). …just wanted to drop by to let you know I picked your fabulous makeover for my feature at the DIY Sunday Showcase this week! Great job & I know our readers will learn from your detailed post! Congrats!! Wow, I’m honored! Thanks so much, Wendi! What a great kitchen makeover…such clever ideas! Thank you for sharing and linking! Great job, they don’t even look like the same cabinets! I remember that style, they were very popular along with the big hair (yes I grew up in the 80’s) and polka dots 🙂 Putting contact paper on the counter top is genius! Thanks, Toni! I have no idea why this style was so popular. I’ve broken more fingernails on those grab bars than I can count, and the combination of oak and plastic-y melamine is just horrible! Hi! Great job on the cabinets! They look amazing. Did you take the cabinets off before painting them? Thanks Ariella! I took the doors off, but kept the rest of the cabinet in place. This is an awesome idea. I’m looking to buy a new house and turned down some otherwise great places because the kitchen looked like this and I believed it needed so much work. But now, I’m definitely going in with a completely different mind! Thanks for posting this. We went through the same process about 2 years ago. We must have looked at 100s of houses before settling on this one, even with the kitchen the way it was. Layout and location is so much more important. Everything else can be fixed! Good luck in your house search! Hi, just wondering how the cabinets are holding up after almost a year of use? Any chips or scratches in the paint? Thanks! They’ve been holding up great! The addition of the door hardware really helped cut down on the wear and tear to the paint. I’ve only had to touch up the silverware drawer because it gets the most use. Everything else looks just like it did when I painted it a year ago! Hi, cabinets look great. 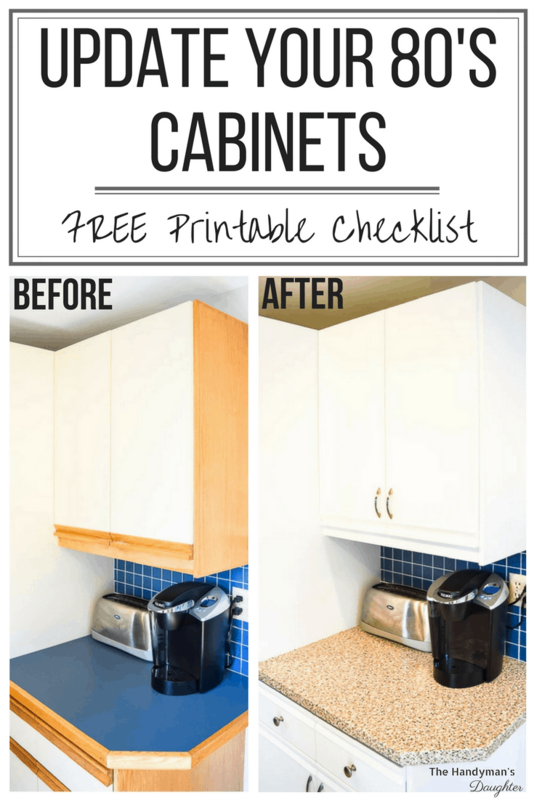 We have the same kind of cabinets and looking for a inexpensive fix…. What type and color of paint did you use..?? I used Rustoleum’s Cabinet Transformation kit in Pure White. You can find it here (affiliate link). Yup, I have always said ‘paint is your best friend’! And I echo the artist brush use, especially the nice wide ones. To get quicker white coverage on wood I cheat and add some calcium carbonate to the primer. It is ground up sea shells so it is hard. Did you need to use the deglosser since you primed the cabinets first? Yes, I used the deglosser first. The cabinets were pretty gross, especially on the grab bars, and the deglosser helped clean them up so the primer stuck to them much better. Just want to thank you for your post. I’m closing on a new home next week that I absolutely love, except for this horrible style of cabinets! Was considering new doors, until we can remodel kitchen in 2 yrs. But this will be much more cost effective. I’ll send you before & after pics when I’m done. Can’t wait to get started 🙂 Thanks again! I’d love to see your before and after photos! I painted my cabinets to put off doing a full remodel, and they turned out so well we’re putting it off even longer! Good luck! These cabinets look fantastic.That is what my apartment kitchen looked like with these type of cabinets. We are also in the middle of updating our kitchen and our removing the laminate from our cabinets and making them shaker style. It’s a process, but so worth it. Thanks for sharing at Merry Monday. Hope to see you next week. Such a fabulous makeover. Love the way the cabinets turned out! It was a lot of work but well worth it. #welcomespring. Sharing on my FB page today. What an amazing update of an older kitchen. I love all these tips. Pinned. This was a great tutorial. I’ve read on other sites, that the melamine part needs to be slightly sanded to help adhere the coats on top of it? Did you do this? Nope, I didn’t sand at all, and it’s been holding up great! 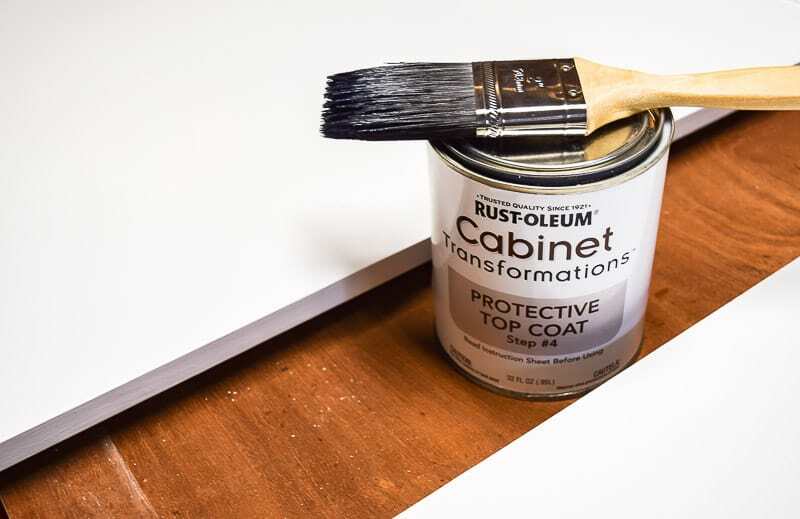 Regular paint may need a sanding, but the Rustoleum Cabinet Transformations paint is formulated to adhere to melamine without sanding.